When did we vote to change our name to Aotearoa New Zealand? Will the Nelson media run this? This illuminating article by Bruce Moon (no relation to Paul) appeared in the Northland Age last Thursday. It is a curious fact that there are many part-Maoris today (though certainly not all) who have remarkably good memories about their alleged sufferings since 1840, but completely blank minds about what happened to them any earlier. It is not hard to work out why this should be. But it is more helpful, perhaps, to assist them in remembering a bit more about their earlier days. This happened again when, just over a couple of years after Captain Cook, Marion du Fresne arrived off our shores. While fishing innocently in calm waters, as he thought, he broke a tapu unknown to him. “declare war upon the slightest pretext, which wars are very bloody; they generally kill any prisoners they may capture”. Not content with dispatching Marion, about 1500 tribesmen assembled to attack the hospital the French had set up on Moturua Island. Greatly outnumbered, the French defended themselves valiantly, using their firearms, of course. And, with no further losses, they killed about 250 of the attackers, including many chiefs who were very conspicuous amongst them. From this episode, the tribes quickly learnt two lessons. It was one reason of many chiefs for signing the Treaty of Waitangi (though to terminate the carnage of the Musket Wars which followed, was another). The second lesson was of the vast superiority of European firearms over their traditional weapons. So bargaining for firearms with visiting ships became a highly important activity. The culmination was Hongi Hika’s return from a visit to England with several hundred muskets, many exchanged in Sydney for gifts he had received. This was soon followed by the most intense slaughter of the so-called Musket Wars amongst the tribes. Hongi’s party returning from England reached the Bay of Islands on 11 July 1821. Shortly afterwards, he began to prepare for his campaign. On 5 September, two thousand Ngapuhi, armed with one thousand muskets, laid siege to Mauinaina pa at Tamaki. It was taken with great slaughter – those killed including Te Hinaki and 2000 of his men, as well as many women and children. The victorious force remained on the battlefield eating the vanquished until they were driven off by the smell of decaying bodies. In December 1821, Hongi attacked, but failed to take, the Ngati Maru pa Te Totara. Upon an idea said to be from his blind and bloodthirsty wife, Turi, he decided upon treachery. A large party of Ngapuhi chiefs went to the pa to offer peace, which was accepted. They received two meres from the Ngati Maru to seal the deal. In the night, Ngapuhi returned to the unguarded pa and slew those within — except the sons of the senior chiefs, who were taken prisoners. Hongi drank the blood of one chief’s son while he was still alive. Proceeding thence to the Waikato pa of Matakitaki, Ngapuhi attacked it with withering musket fire. Even though the Waikato were led by chief Te Whero Whero, with only four muskets they were virtually defenceless. 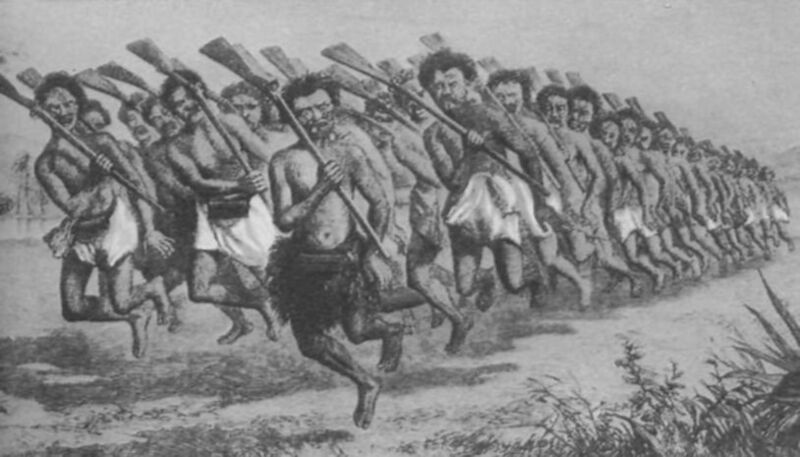 Trying to escape, many hundreds were trampled to death in the deep ditch surrounding the pa, or by Ngapuhi firing down upon them until tired of reloading. Hongi’s opponent, Te Waharoa of Ngatihaua, was equally bloodthirsty. He is reputed to have been the equal of Hongi, and to have terrified Te Rauparaha and even Te Whero Whero. Te Waharoa concluded an uneasy peace with the Ngati Maru chief, Takurua. Then he and his tribe arose at midnight and massacred in cold blood the too-confiding Takurua and nearly every man of his tribe. Their bodies were devoured, and their wives and property were shared by the ruthless Ngatihauas. Te Whero Whero, for his part, decided to make war in Taranaki, and attack the formidable pa of Pukerangiora. When the starving defenders broke and ran, Waikato attacked. It is said at least 200 escapees died immediately, with Te Whero Whero killing 150 single-handedly with blows to the head. It was only when his arm grew tired and swollen he was forced to stop. Those captives with finely tattooed faces were beheaded carefully on a wooden block, so their heads could be preserved. Later, dozens of slaves were dragged away, carrying the heads of their relatives to be hung as war trophies in the Waikato villages in the north. It is thought that as many as 1200 Te Ati Awa people lost their lives at Pukerangiora. Those that stayed behind in the pa watched the awful fate of their whanau unfold before them. The scene that followed was terrible, with huge numbers of the dead gutted and spit-roasted over fires. Some Waikato warriors indulged in a feast of such gluttony that they died. Te Rauparaha was sometimes called “the Maori Napoleon” (but more accurately perhaps “the Maori Genghis Khan”). He perceived that the Waikato were probably too strong for his Ngatitoa tribe. So he commenced a long migration south, inflicting heavy slaughter upon Rangitane on the way. Establishing himself on Kapiti Island, Te Rauparaha commenced an invasion of the South Island. He almost exterminated the northern tribes. Then he fell upon the Ngai Tahu, first at Kaikoura, then Kaiapohia, and in 1832 upon Onawe, with bloody massacres, cannibalism and slavery in each. The Ngai Tahu had already been weakened by their own “Kai Huaka” or “eat relation” feud. These are but a sample of incidents from almost continuous warfare amongst Maori tribes in the decades before 1840. The social impact must have been profound. the “relentless and intense social stresses”. It becomes clear that it is high time that this important part of our history should be recognized, and faced squarely. It should be borne in mind when facing the substantial social problems which confront New Zealand society today. Perhaps, for a start, a substantial part of the massive “treaty settlement” which Ngapuhi will undoubtedly be expecting, could be allocated instead to those other tribes which they harmed so. Tu-mata-kokiri who confronted Tasman in turn got their comeuppance, being exterminated by Ngai Tahu and Ngatiapa, the last battle being in the Paparoas about 1800. For a good account of this episode, read Ian Wishart’s “The Great Divide”, 2012, ISBN 978-0-9876573-6-7. See T.L.Buick, “The Treaty of Waitangi”, 1914. Many of the details in this account are taken from “The Encyclopedia of New Zealand” and other sources, easily obtained by “googling”. Much is summarised by Pember Reeves in “The Long White Cloud, 1898, republished as ISBN 0-85558-293-6. “When Two Cultures Meet”, 2012, pp64-65, ISBN1-872970-31-1. “This Horrid Practice”, 2008, pp151-3, ISBN 978-0-14-300671-8.